House Speaker John Boehner accused President Obama Monday night of creating a "crisis atmosphere" in negotiations over increasing the debt limit, saying that if the president will simply sign House legislation to increase the debt limit that atmosphere "will simply disappear." Boehner made his remarks following a prime time address by Mr. Obama, who he suggested "wanted a blank check six months ago, and he wants a blank check today." "That is just not going to happen," Boehner said. With just eight days remaining before the August 2 deadline, when the Obama administration says the United States will breach its legal limit on borrowing, Boehner was defiant in his remarks, suggesting that House Republicans have passed one bill and will this week pass another that would alleviate the crisis. The speaker left out some important context, however. The bill that has already passed - the 'Cut, Cap, and Balance' Act - would require deep cuts in entitlement programs, and it is virtually unthinkable that it could pass the Democrat-led Senate. And the bill he says will be passed this week is no sure thing, with Conservative Republican Study Committee Chairman Jim Jordan, leader of a fiscal conservative faction, saying he opposes the new bill and that "only a Balanced Budget Amendment will actually solve our debt problems." The new Republican bill involves a two step process that begins with immediate cuts and caps in discretionary spending, potentially saving $1.2 trillion over a decade. In exchange, the debt ceiling would be raised by less than $1 trillion, enough to last the nation through the end of the year. The spending caps would trigger automatic across-the-board spending cuts if not met. The House GOP plan then creates a 12-member "Joint Committee of Congress" that would additionally identify $1.6 to $1.8 trillion in deficit reduction over a decade. The House and Senate would consider those savings in an up-and-down vote, without amendments. If the plan passes, President Obama could then request a separate, $1.6 trillion debt limit increase. The president and Senate Democrats have ruled out that plan, however, saying that the short-term increase it requires would create economic uncertainty and potentially result in the United States losing its triple-A credit rating. Boehner said in his remarks that "the United States cannot default on its debt obligations," echoing Mr. Obama and Democrats' insistence that the debt limit be raised. But he cast the president and his party as unwilling to compromise by passing the House GOP legislation, saying "the president would not take yes for an answer." "Even when we thought we might be close on an agreement, the president's demands changed," Boehner said, a possible reference to Mr. Obama's call for greater revenues as part of a "grand bargain" deal that would have reduced the deficit by up to $4 trillion. 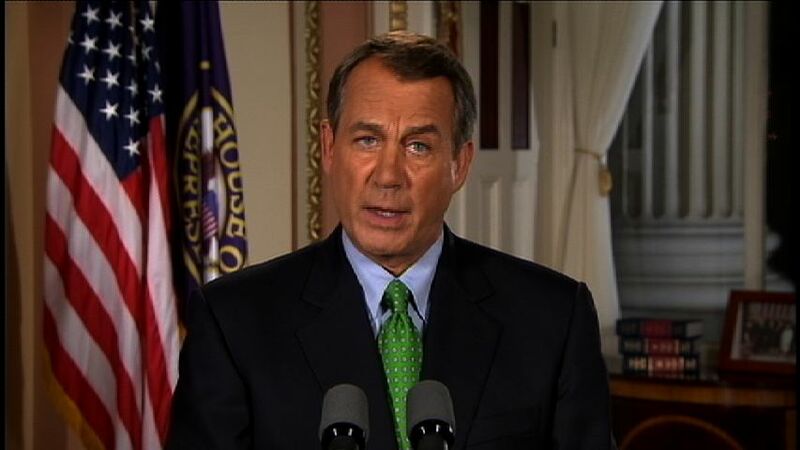 Boehner walked away from that effort Friday. Of Mr. Obama's call for a "balanced" approach in the debt limit deal - one that includes both spending cuts and revenue increases - Boehner said it amounts to Washington-speak for "we spend more, you pay more." "The solution to this crisis is not complicated: if you're spending more money than you're taking in, you need to spend less of it," he said. "There is no symptom of big government more menacing than our debt. Break its grip, and we begin to liberate our economy and our future." Democrats offer debt plan they say GOP "can't refuse"
Boehner's speech follows a Senate Democratic proposal to increase the debt limit through the end of next year in conjunction with a bill that cuts spending by $2.7 trillion. Critics note that $1 trillion in those cuts come from expected savings from winding down the cost of the wars in Iraq and Afghanistan. Democrats say that plan meets both Republican objectives - it does not include revenue increases and cuts more in spending than the debt limit increase - and thus Republicans are faced with a deal they "can't refuse." Boehner described that deal as "filled with phony accounting and Washington gimmicks" Monday. The Obama administration has said that without congressional action, the U.S. will breach its limit on borrowing next Tuesday. That could cause the U.S. to default on its debt as well as a host of other negative outcomes, including the suspension of Social Security checks, military pay and other obligations, and potentially cause global financial chaos.